Gmail is a world's most popular free email service owned by Google. Over 423 million users using Gmail from across the World. Here greatest news for all Gmail users, now Gmail allows you to send files upto 10 GB at once. Previously Gmail users can send files upto 25 MB at once. Now it increased around 400% by combined with Google Drive. Famous cloud storage service Google Drive now comes into Gmail. 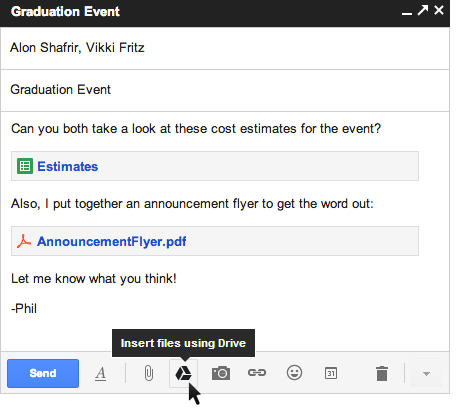 So now users can insert files up to 10 GB from Drive directly into an email without leaving your Gmail. Whenever you send a file from Drive that isn’t shared with everyone, you’ll be prompted with the option to change the file’s sharing settings without leaving your email. This Gmail new feature only available for Gmail new compose window users. If you haven't yet click here to enable new pop-up compose window. Note that this new feature is rolling out gradually in next few days. So wait for your turn to use this feature.